Burn Brae Day Camp: Innovation, Imagination, Exploration! My kids are both in full-swing “kid mode” at camp, currently enrolled in the Junior and Step-Up programs. Just the other day I was reminded of how young they were when they first started camp at Burn Brae Day Camp of Creative Arts. I was watching the littlest campers, the Pre-Major A group, and saw the giggles, laughs, and excitement as they walked from their last activity to the pool for morning swim instruction. They were instant friends, holding hands and sharing inside jokes. They still had pudgy cheeks and a few had puddle jumpers for the pool. “Adorable” isn’t a strong enough word to describe it. My kids started out their camp experience in this very same Pre-Major program at the ages of 4 and 6, my son right in the middle of the youngest group, and my daughter in the older Pre-Major group for kids slightly more mature. My son wasn’t even in kindergarten yet, not used to being away from Mom for so long either. They couldn’t have been in better hands. The love for Burn Brae started here and I was able to watch them grow to love the beautiful sprawling campus, become familiar with the programs and grow to love the counselors. The Pre-Major experience at Burn Brae helped my children grow so much during such a pivotal point in their lives. They experienced theater, learning songs in French, had daily swimming, played games and had group snack time and lunch with their best friends at camp. At Arts Fest, I was able to watch them perform their songs, stand on stage for show time, and see them grow not only in confidence but in diversity of what they were learning and exposed to at such a young age. Pre-Majors at Burn Brae have set schedules so they are with the same caring and educated counselors all day long, and the relationship they develop between them is wonderful. I loved picking them up in the designated fenced play area just for the littlest campers and sign them out every day to hear story after story of what they learned, what special guests and events were happening and just see their smiles said it all. It was a wonderful start to what has been a long-lasting relationship with Burn Brae that is now on it’s fourth summer – going strong. My friends always ask me about when to start their kids at camp. To me, the socialization and experiences gained are priceless, and Burn Brae offers flexible scheduling and weeks so that your child can attend as many days or weeks as you think is right for your child. If you are unsure if a full week is too much for your three year old, you can start off with 2 or 3 days a week, just like in preschool. In addition to offering their traditional full-day schedule, Burn Brae also offers a half-day option for Pre-Major campers. I can pretty much guarantee that they will be asking to go for more next summer. The Pre-Major program is specifically for campers ages 3-6, after which they “graduate” to Juniors or the Step-Up program. Staffed by professional educators and instructors, their schedule is specifically made for their age group and maturity. The Pre-Majors are divided into two groups based on age and grade level. Below is a sample schedule for a “typical week” at Burn Brae Day Camp of Creative Arts. 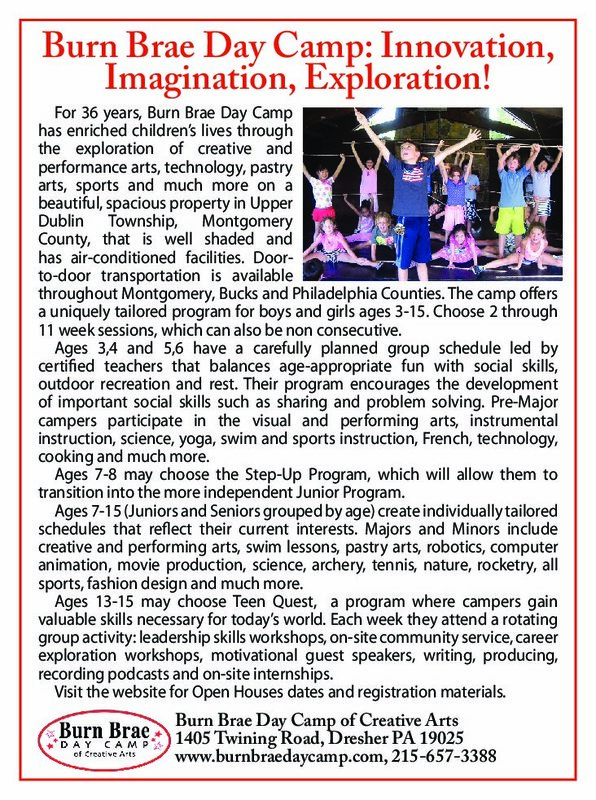 For more information on this program offered at Burn Brae Day Camp, please contact the camp office at 215-657-3388 or visit their website. Stay tuned to Mommy Entourage, as I’ll be blogging about our camp experience all summer long!